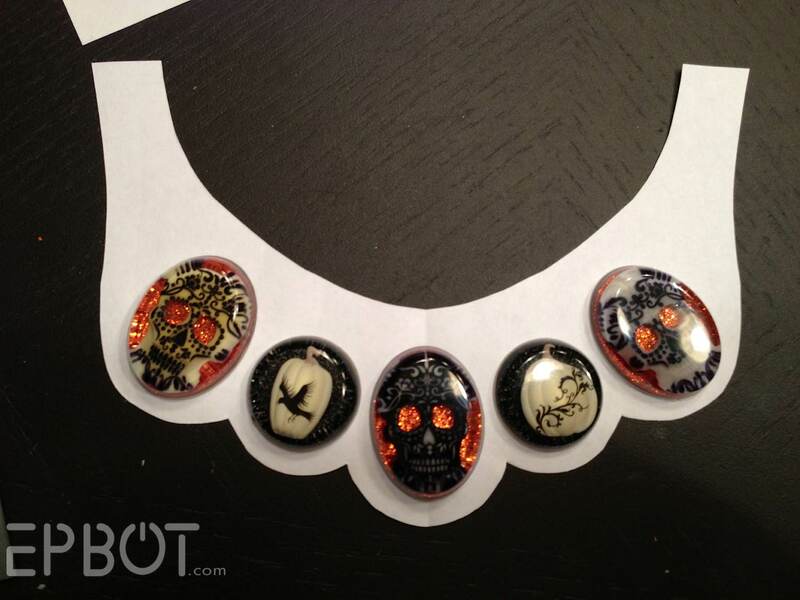 EPBOT: Glam Halloween Jewelry Made From Scrapbook Stickers! 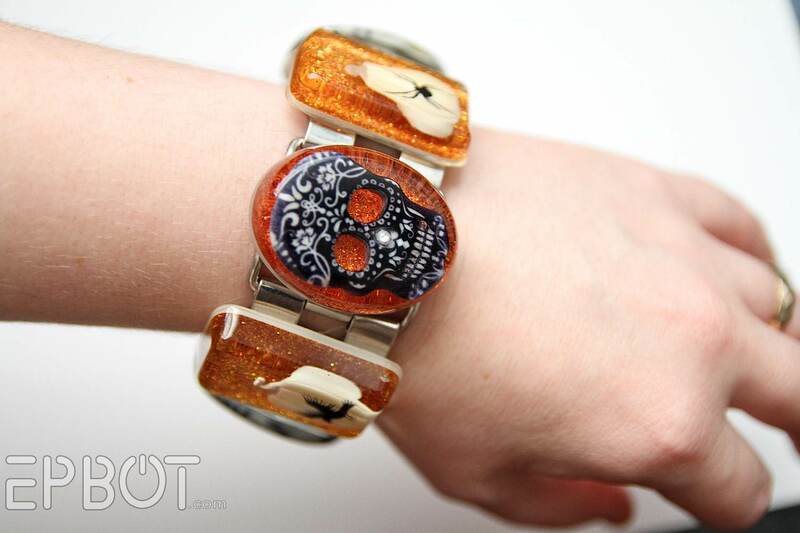 Glam Halloween Jewelry Made From Scrapbook Stickers! It's huge, heavy, mildly(?) tacky, and I kind of love it. Yep, I finally decided to give resin another try, but this time I went with the Little Windows brand. You might recall I used Easy Cast last time, and had issues with some batches not curing. I told you guys then how much I liked the video tutorials over at Little Windows, though, and I guess that made an impact, because the owner Fran sent me all kinds of her products to try as a thank-you. YAY CRAFTY STUFF!! The best thing about Little Windows resin kits is that they come with soooo many useful accessories, like those template patterns you see on the right. Just trace & cut for the perfect size to fit all the different molds! And the distortion makes the black glittery paper look like a hyperspace jump - shooting stars galore. 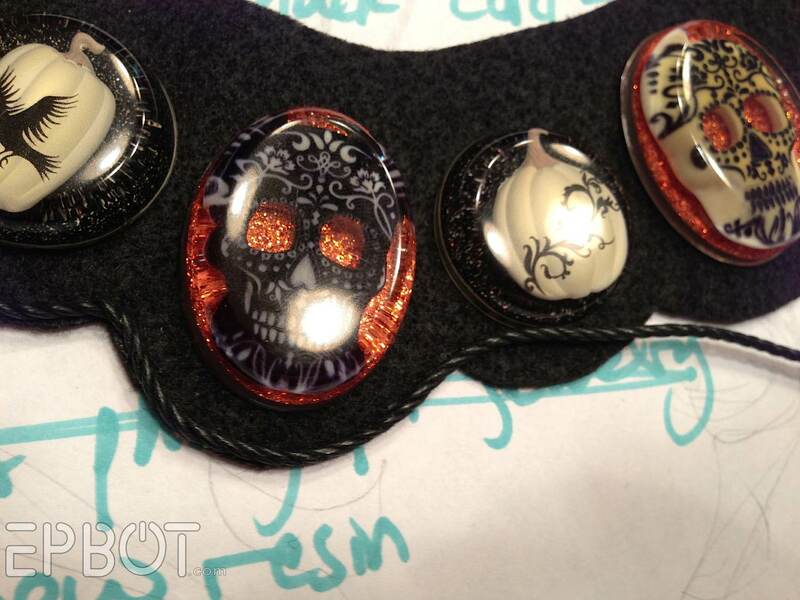 The plastic skulls all had a tiny bubble right in the nose cavity - oops - so I glued little crystals on top to hide 'em. For my next batch, I put a small drop of resin in all the noses first, let that cure, and then embedded them. No more nose bubbles! I found that jointed bracelet in my discard stash (always save old jewelry! ), and it fit the resin perfectly. I just had to glue each gem onto the links with E-6000. Easy peasy! I bet it'd look cute over a collared shirt, too. From there it was just a matter of gluing everything down and hand-stitching the ribbon ties on the ends. The trim is a little tedious, but I really think it adds a more polished look. K, that does it for this round of resin experimenting! Now, who wants some free jewelry? Hope this inspires some more resin experimenting of your own, everyone, and be sure to share your own pics in the comments or over on the Epbot FB page! PS - That reminds me: one of last month's art winners never claimed her prize! So, Lauren-who-wanted-the-albino-ferret-print, please e-mail me your mailing address! I love the Orange one best! The black one is soooo pretty! Orange is my favorite color, so I've got to go with that one! Oh, the orange! For sure! I love them, both beautiful. I'd wear either one. I absolutely love the black one! The practical side of me loves the black and white, but the orange is gorgeous! I covet both! I love the orange glitter! Love the orange! Most people don't understand my love of orange, but that necklace would show the haters how awesome orange is! I love the orange pumpkin!! Orange! I love reading your crafting posts.... I've got the crafty itch..... I'm going to try and make my own Elsa type costume for Halloween. It will go over well at my preschool! I like both, but probably the black one best! ACK! The bat is so adorable! Your resin skills are amazing. This jewelry all turned out really beautiful and, like the rose petal resin jewelry, it's super inspiring, and it makes me want to resin ALL THE THINGS. Alas, I do not wear necklaces or bracelets or big earrings or rings, so I have no idea what I would even use it for. Gifts, maybe? Anyway, so I'm not commenting to enter the giveaway. Just wanted to tell you how awesome it all looks. *contented sigh* I love Halloween and Epbot! Orange is the only answer! I love the black one. Awesome! 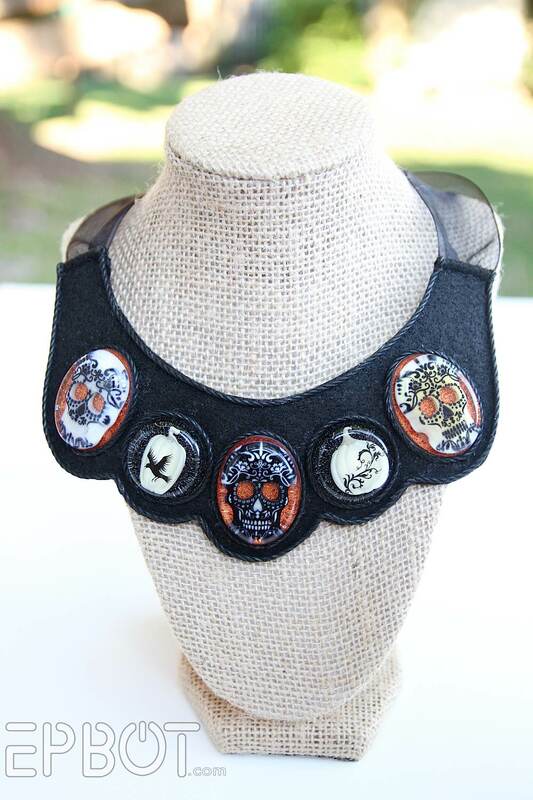 I love everything you made, but as far as the giveaway, the black necklace! I have a thing for bats. And pumpkins. And black. 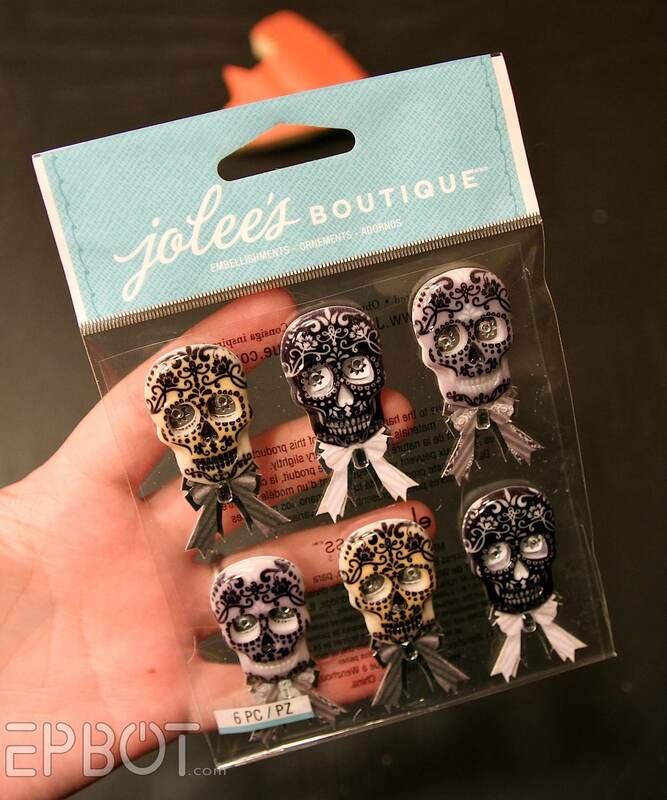 You were the inspiration for me to try using resin for the first time a while ago and are inspiring me to run to JoAnn's so I can try my hand at it again! Such a cute idea. Soooo cute! I love the bat!!!! I love the orange one! But I'd happily take the black one, too. It would be fun to have one to inspire me when I finally get the nerve to try this on my own! These are both GORGEOUS! I would love to have the black one! You are so crafty. You keep showing us things that I want to try to make, but I am anxious about getting the materials and discovering that I can't replicate the goodies! I read this whole post thinking "i want. i want." You read my mind! They're both gorgeous but I think the bat on the black is calling my name. They are both awesome! I think the black one is my favorite by just a teeny tiny bit. :-) I'm not a crafty person but your blog is so inspiring! I think I might actually try to make something with resin. OH this is so fun! I'll have to check them out...thanks for the tips! Ooooh, the black one would go perfectly with my Halloween costume. A friend just steered me to your site. What a treasure! Can't wait to dig through the archives. This was a great project. I like the orange glitter background with the white pumpkin. I will definitely check out the resin website. I can always use tools to help make my resin work better. Thanks so much for offering your beautiful necklaces as prizes. I love them both, but I think I like the black one just a smidge more. Thanks so much for the useful info and the chance to brighten up my Halloween season. That orange is FABULOUS!! I am definitely going to check out that brand of resin. I've always wanted to try it, but your last experiences scared me away! They are both super cute, but the black one is more me, I am working on a bat costume. The orange one is my favorite, but would love to win either one. I've never worked with resin, but you make it look easy and fun. Thanks for sharing your many crafting skills. The orange one!!!! Although I love both! 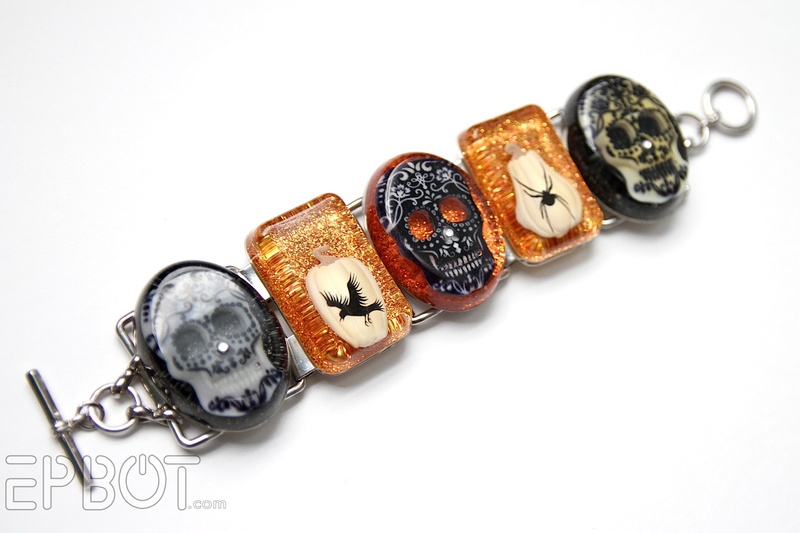 I really want to try resin now, maybe need to ask for some for Xmas from hubby. The orange one is awesome. I love them both, but the black one is my favorite. The orange one is lovely! The reason jewels glitter is because they have a different density than the air around them and the light is reflected back when it shines on the planes in certain angles, and is bent at other angles. The bent light then is reflected by other planes at the backside of the jewel and shines toward your eyes in yet another angle. So no matter where the light comes from, some parts always make it towards your eyes and you see it as glittering. But what is really needed is planes and edges in all the right places and the light coming from a less dense medium (air). Resin has approximately the same density than the plastic jewels you where using back then (I think I recall the glass ones working better), so all the planes and edges between differently dens mediums where gone. Real diamonds would have worked much better, since they have a very high density, but then who pours resin over real diamonds? The glitter paper works because there is a protective layer over the glitter anyways so it's smooth (wouldn't work with rough glitter paper or sand paper), so the resin never really touches the glitter itself. I love them both, but the orange is calling my name! I love love love the firey orange one!!! These are awesome looking! I'm partial to the orange glitter. Love the pattern on the pumpkin too. I absolutely adore the black one! Very cool! I like the orange one the best. So cute! I've always wanted to try resin but have been scared. I would love the black necklace. Love it! 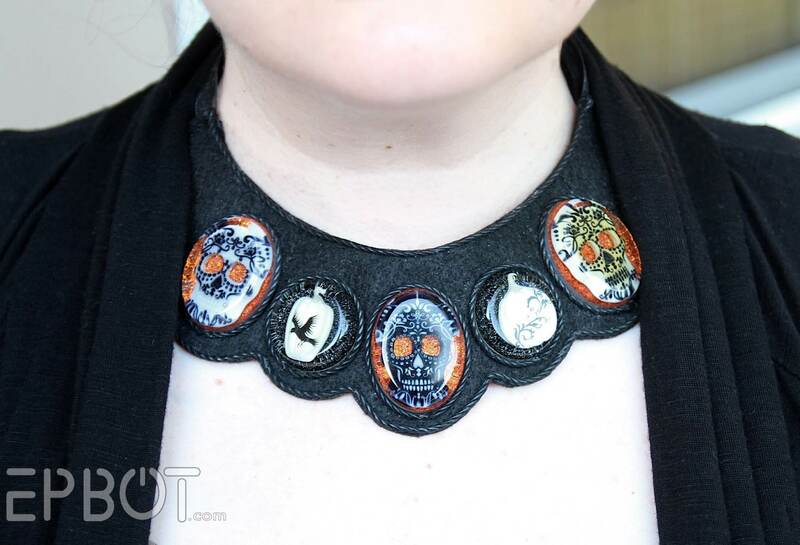 I never would've thought of the diy bib necklace!! That bib necklace is fantastic. I love what you come up with. And I'd love the black bat pumpkin if you pick me! I love the idea of using the stickers that already have dimension to them in the resin, they look fabulous against the paper. 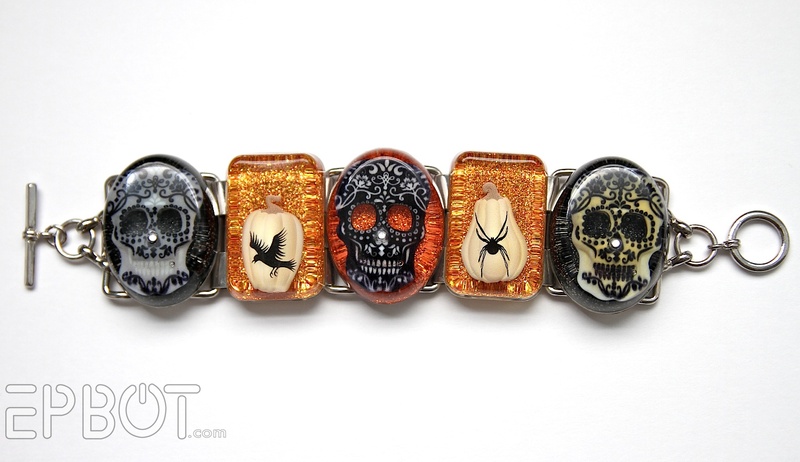 I've never been brave enough to try resin myself, but those look fantastic. 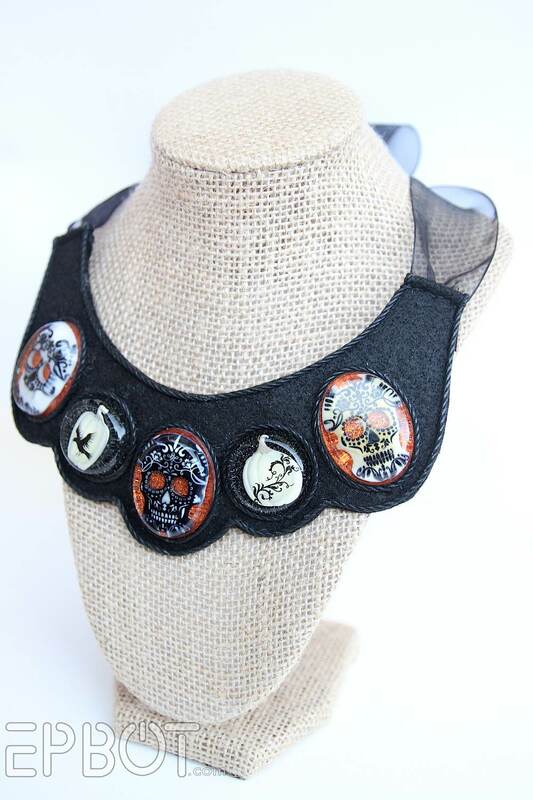 I've never entered a giveaway on your blog before, but I LOVE that orange necklace! 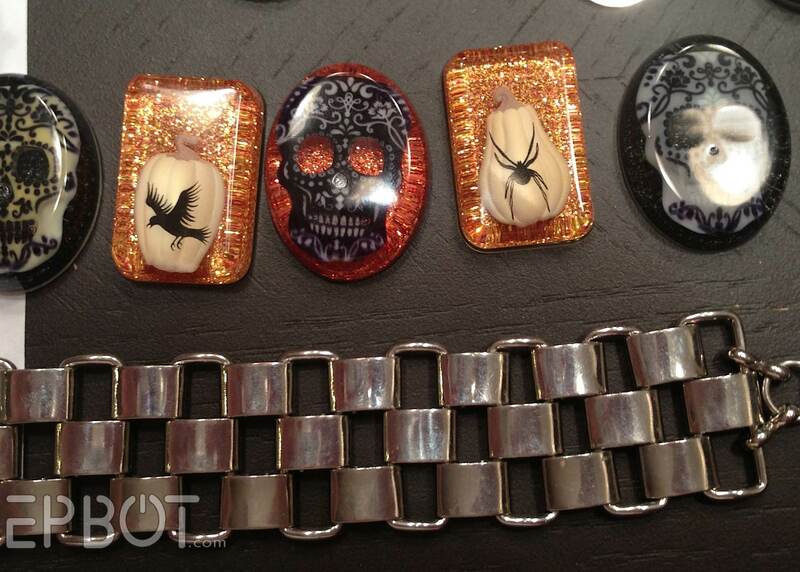 I really shy away from most Halloween jewelry but these are so pretty and classy. Love them! 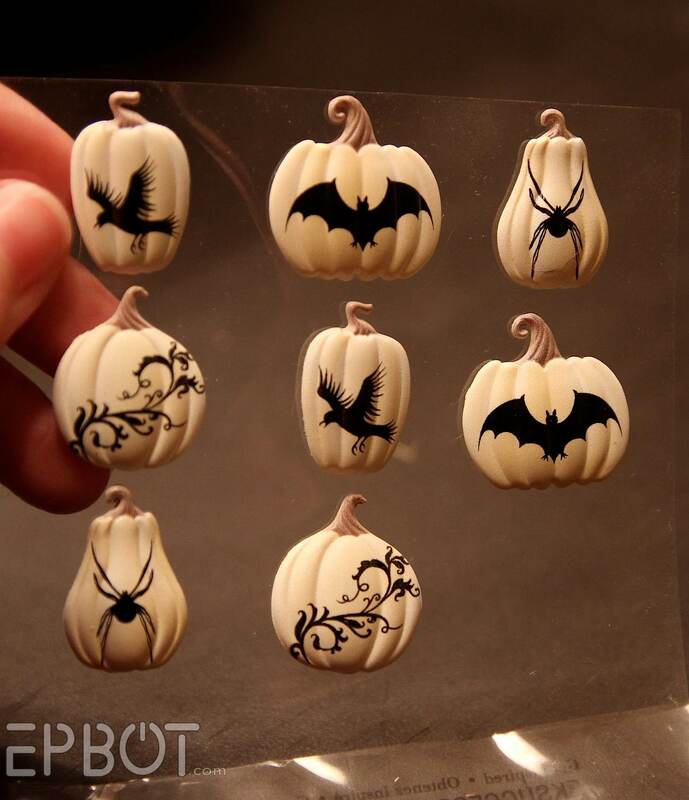 I love them both but because I have to choose, I would go with the black and white pumpkin. I love the little bat. If this stuff is as easy as you say I may just give it a try. I am notoriously a person who will pick up a crafty endeavor and quit if it takes more then one sitting (it's why I like to bake and cook instead of knit). While I like both of them I like the black backed bat the best. Oh, those are lovely! I remember my dad doing resin casting when I was small. He had bronze resin he would pour on as a background for the things he made. I think both of those pendants are lovely. I like the orange more, because of the delicate tracery on the pumpkin, but since I own not one shred of orange anything, Blackbat McBatterson would probably be the more sensible choice. (Thinks...) Nope, the orange is just too gorgeous! You have converted me to the orange side! Those are lovely! I love them both, but if I was forced to pick, the black would be my choice! These are lovely. I like the orange one a little better, because of the pattern on the pumpkin. If I am not too late to the party I would like to express my love for all of these ohmahgoodnessthesparklies. Ladies love the sparklies Mrs. Frisby. I've never dipped a toe in making resin molds before, but I'm seriously wanting to now. I also like that orange pumpkin one. I'm completely digging the orange glitter, and I'm so not a glitter kind of girl! My birthday is the day before Halloween, and it's my favorite holiday. I'd like to offer you a tip to help with the resin bubbles - a BBQ lighter, the long ones with the trigger. Let the flame lightly lick the top of the resin and it will bring all the bubbles to the surface. The next pass should pop it! Learned that from the Resin Crafts Blog! :) Thanks for the giveaway. We don't even do Halloween over here in New Zealand but I still want one of those! And I love me some orange! I'm adoring the black one. They're both gorgeous but that black one, eee! Kim G here! I love both, the black would go with more, but the orange makes such a statement... I can see myself wearing the black one for a evening out or even to work to share the season. I love both!! If pressed to pick...orange, I think. Okay, now I'm thinking I might just have to give resin a try! I need some charms for necklaces for my Disneybounding outfits, and I'm having a hard time finding exactly what I want. 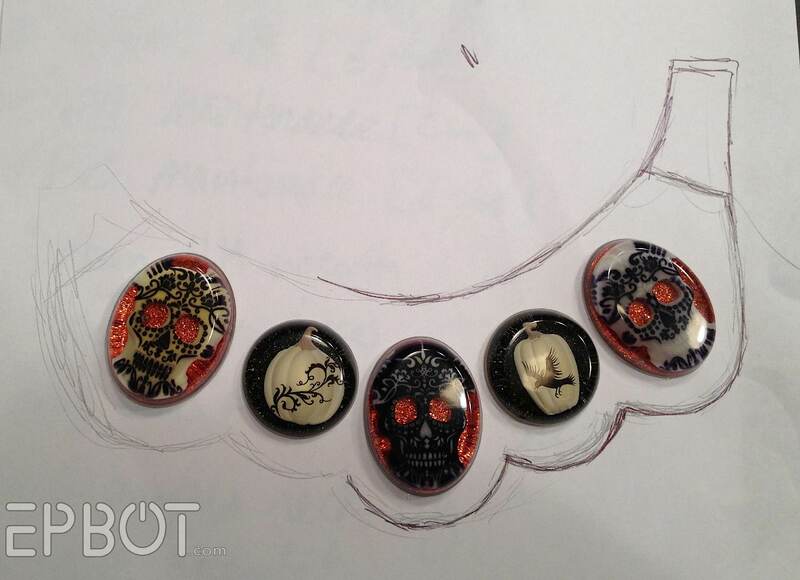 Seeing this project gave me the idea that maybe I could experiment with resin to create my own charms. I love your creativity with these! I really like the orange pumpkin - I agree, the orange looks like fire! The orange makes me want it to be Halloween right now! So lovely! I love the orange one. The pattern on the pumpkin is gorgeous. 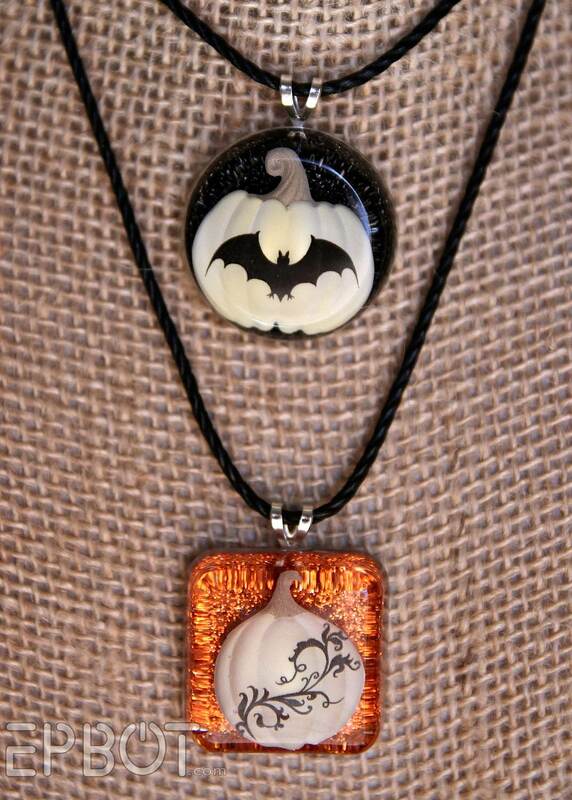 Tough call as I adore that orange sparkle, but as a necklace I think I like the black bat pumpkin. I think the black bat balances with the black glitter better. These are so cool! I love the special detail prettyness on the pumpkin in the orange necklace. I might need to find a set of those stickers for myself! 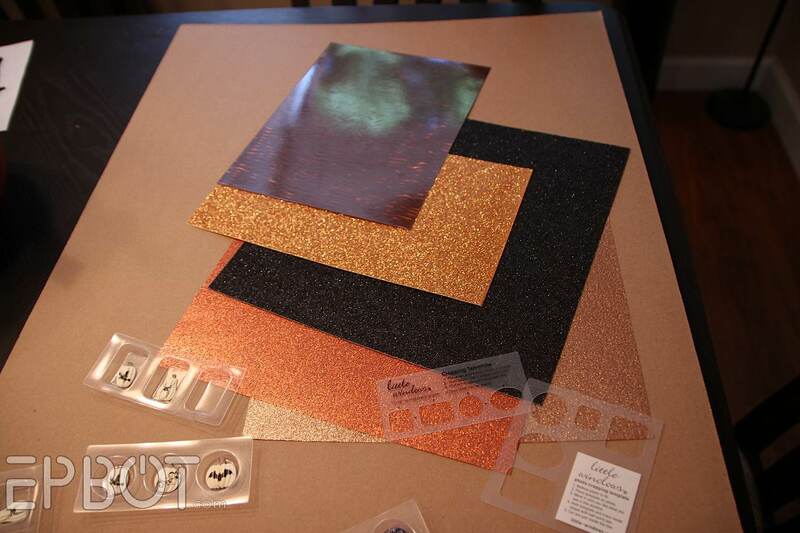 Love the pumpkin in the orange one and they way the glitter paper looks! The orange one is my favorite! Love the little vine across the pumpkin. The black one with the little bat is my fave. Anything orange, it's my favourite colour! Gorgeous! I love the black one! 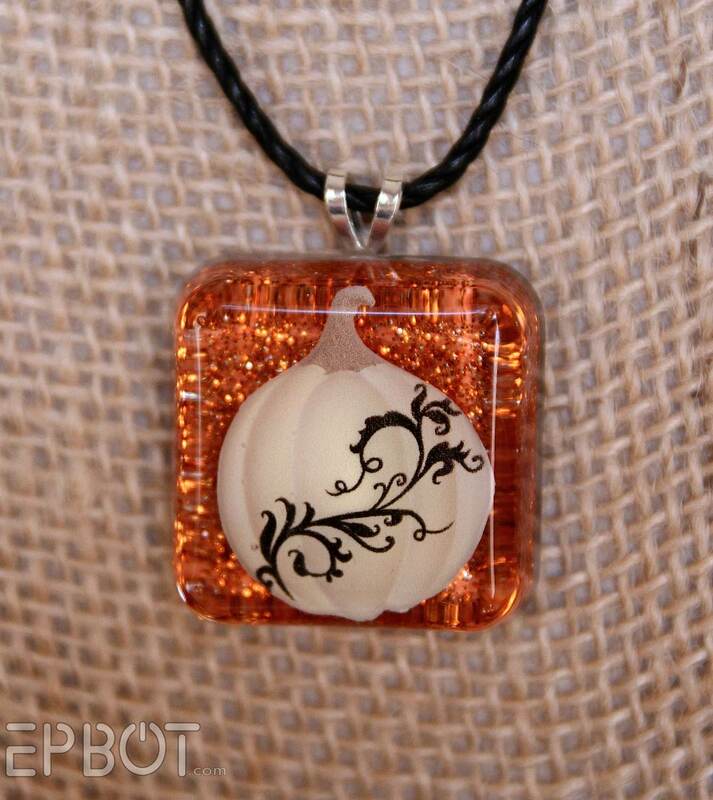 I love love love the orange and white pumpkin pendant! The orange is just lovely!!! The black. I love the way the pumpkin sits in the round. They're both magnificent! But I think the black bat would suit me better! I love the black one- it screams Halloween (pardon the pun). Ooooohhhh the orange is so beautiful! I would love it! The orange one is gorgeous. Nice work! Really really really like the orange pumpkin one! Beautiful! They are both really pretty but I think I like the orange one best. That statement necklace is very cool! Good work! First-time commenting because this batch is so beautiful! I like the black pumpkin! Count me in--I heart the orange! Hi Jen, love your site and your crafty sessions. I would LOVE to win the orange necklace, so fingers crossed! I loooooove the black pumpkin! Thanks for sharing your experiences with resin, I've been wanting to try for ages but feel very intimidated! Both are very cool and make me want to try using resin. I think I like the orange one best. I love the orange one! The sparkly paper just looks so neat inside the resin! How to choose! They are both fantastic! The orange is the winner, but I'd be thrilled with either! Ooooh! I really like both of them! 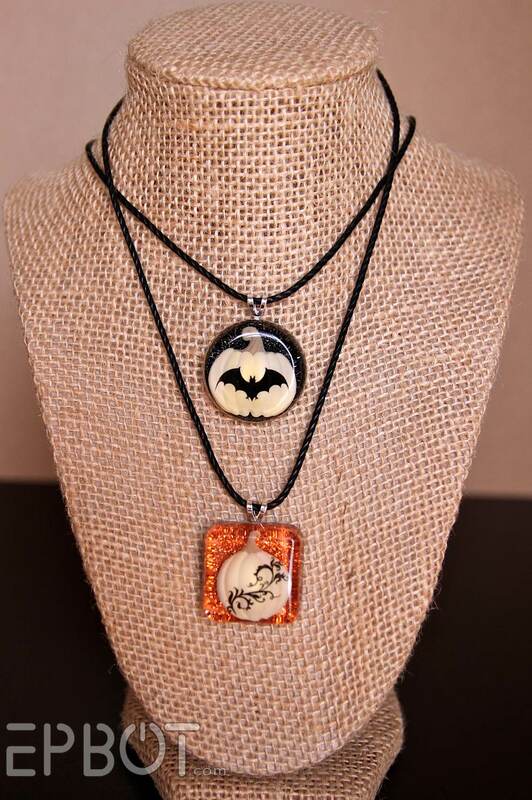 But if I had to pick I think I'd go for the black bat one :). Ooo! These are so cool! I need that black pumpkin! Both are beautiful, but the way you describe the Orange has me sold! I love the orange one. I see all your projects like this and want to try them but I never feel like I have the time with kids and work, but this looks so cool I may finally break down and give it a try. The moment I saw the sticker in the orange one all I thought was "WANT". All the gems are soooo cute but I have a place in my heart just for the orange one. The winner is gonna be so lucky. I love this, especially the orange one! I NEED to get one of these kits now, you enabler! LOVE them both, but the orange one is the best! LOVE them both!! The orange is amazing though! Those are lovely :) I'd love the black one! Beautiful work (as usual) -- I think I prefer the orange one....it is the fiery looking background that did that! I honestly love both of them, but I'd probably wear the black one more. But if I win, I don't care which one you give me! They're great! That really makes me want to try resin. I've had the crafty itch for a little bit now! And I love love love the black one. And the orange one. And the black one. Argh, why you makes me makes choices?! I totally agree, the orange is beautiful! I'd love the orange one! Very creative! Both are gorgeous! Love the orange one especially! Both are beautiful, but the black one is my favorite! They're both beautiful, but I prefer the black one. Your jewelry is always beautiful and all your tutorials are great. Ooh, they're both so lovely! It's a tough call, but I think the black one calls to me slightly more (maybe because of the bat). Right now I'm focusing on thinning out my yarn stash, but maybe once I do that I can take up playing with resin. A friend gave me her scrapbook supplies so I'm sure I could find something to turn into jewelry. That orange one is simply delicious! Must have it!! I love the orange one because of the color and the scrollwork on the pumpkin. Plus, versatile since you can wear it into November for Thanksgiving/Harvest. I love the black one--so cute! They're both lovely, but I just love the swirls on the orange one! Both are gorgeous but I love the orange one best! Definitely the orange. It has a nice sparkly pop. Ooh, I think the orange, glittery background with the pumpkin! Oooh! That orange one is so pretty! I just love the swirls! That orange is just beautiful! Your craftiness is crazy good! I'd love to wear one of your pendents! I love them both, but I have a shirt in mind to wear with the orange one! :) thanks for the contest, Jen! My kindergarten class would love me in either of these! Love the orange just a smidge more than the black though! Love the pumpkin one! You are so talented. The orange. So very much the orange! I Love the orange pumpkin! The orange one is beautiful. Mind you I am a huge fan of orange so that might tip the scale a bit. I love both very much, but the orange one is just beautiful! Great job again! You are always inspiring me to try new things. I love the black one. Thank you for doing such great things for your readers! Well might as well try to win the black pumpkin :) Halloween is my favorite and spooky crafts are the best! Both of them are gorgeous, but I positively ADORE the orange one. You're right--it really does look like fire! I really really want to try this! Love the orange! I like the orange pumpkin, though both are lovely! Beautiful pieces! Nicely done, Jen. If chosen, I would like the orange-backed one please. Love the black and the 3D affect! I love the black bat one! These look so fun! I really love the orange one! So pretty! 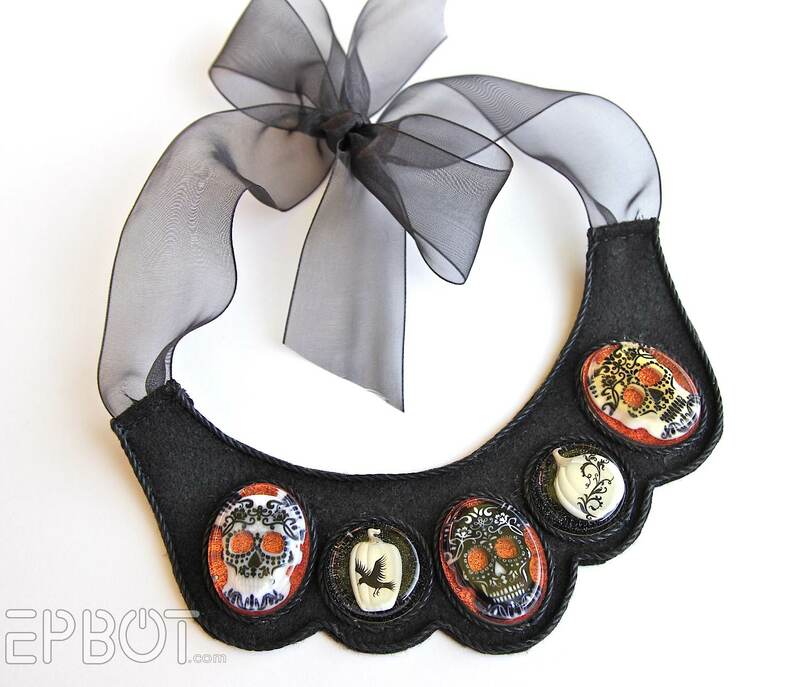 I also think the bib necklace would look really cool if made with a big piece of gothic black lace. :) Great job on all of them! The black backed one with the bat is my favourite! Ooooh, I like the orange one! 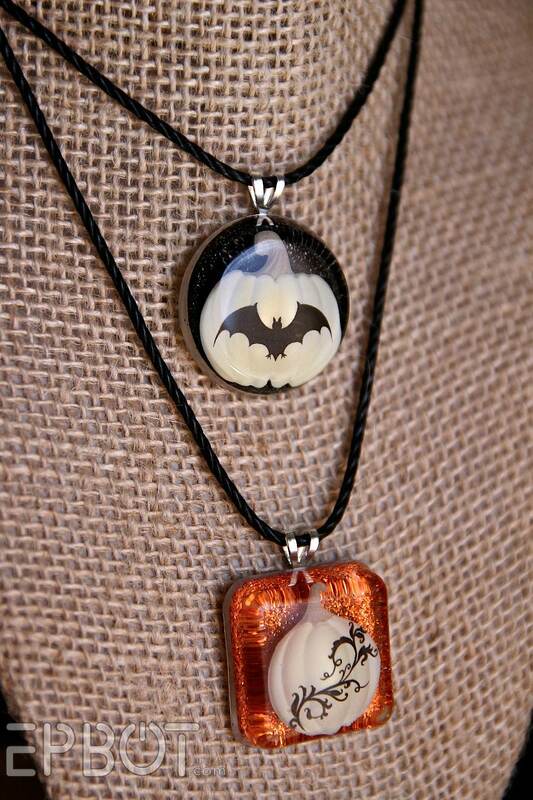 I really like both, but the black with the white pumpkin and bat is my favorite! Love the black...the hyperspace effect! I really love the black one!